Lauren’s passion for sports and helping others led her to obtain her Bachelors Degree in Kinesiology from Wesley College in Dover, Delaware. In which she then acquired her W.I.T.S. Personal Trainer Certification and Spinning® Instructor Certification. Lauren has experience as a Fitness Specialist working for US Navy; as a fitness specialist she prompts healthy lifestyle through exercise working with clients ranging from all ages. She organizes a wide variety of fitness classes that involve cardio and strength training, such as spinning®, lower body strengthening, upper body strengthening and High intensity interval training. Through her passion for fitness she offers clients training advice and motivation to achieve their goals. 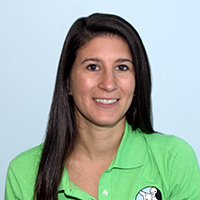 Grace is a Kean University graduate with her degree in Exercise Science. Grace has an infectious passion for designing exercise and nutrition programs that maximize workout efficiency, improve fitness, increase stamina and develop an overall sense of well being. Her transcending ability to coach and motivate clients and create an environment where wellness goals are heard, nurtured and executed produce lifetime results. In 2007, using execise DVDs, I began learning resistance training to control my Type-2 diabetes. In February 2011, I began training with Chad. He keeps my routine new and interesting and guides me to avoid injury. Best of all, he encouraged me to stop smoking. In April, with Chad’s help, after smoking cigarettes for 47 years, I quit without gaining any weight! Thank you Chad! There are so many things to say about Chad that it is hard to write them down. I have never met anyone as caring and compassionate about people as Chad is. He saved my life in so many ways. You know that he loves what he is doing just by talking to him. He always has some comforting and motivating words to say to encourage you to become a better you. I wait anxiously every week to get to “Chad day”. I can not repeat myself enough to say nice things about Chad to anyone who will still listen to me go on about how wonderful he is, but most often people see the results all on their own. Chad is an asset to his profession and to this world. I’ve been working out with Chad for about 6 months. He started off by teaching nutrition in detail. This gave me a sound start on my overall weight loss. I used to skip meals and over eat at dinner time. Now I have learned to eat 5 times a day. This is monitored by Chad weekly and is tweaked based on weight loss and hunger levels. After learning how and what to eat, we began weight training. Chad keeps working out exciting by introducing me to new exercises and pushing me to my potential. I have lost 20 lbs and I am in the best shape I have been in the past 25 years. I highly recommend Chad to anyone who is interested in feeling great and looking good. Thanks Chad! Kids Corner: To Crawl or Not to Crawl? That is the Question. Kids Corner: The Importance of Tummy Time!